We've lifted the curtain on our newly transformed Guestrooms and Suites - yours to indulge immediately with the unveiling of our enhanced living-room lobby to come later this spring. Our design was inspired by the vibrant city outside our doors and the Great Lake that lies just beyond. 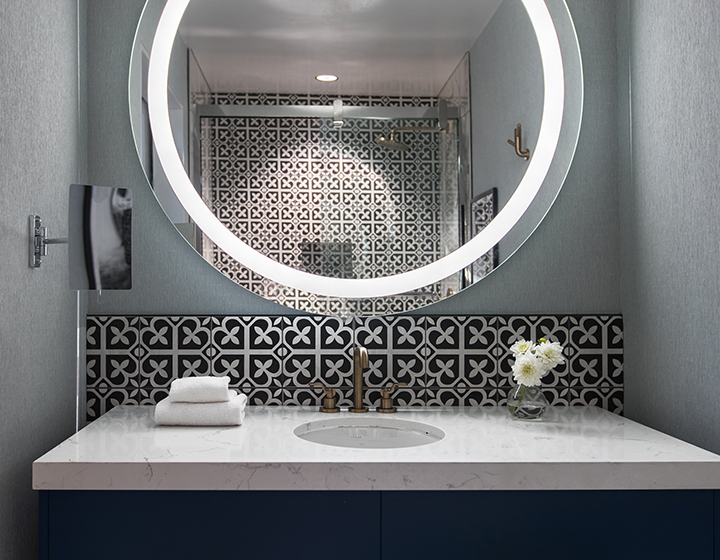 Renovations reveal the new Monaco, a sophisticated yet playful home base for urban adventurers, both first time visitors and those who are drawn to the Windy City again and again. 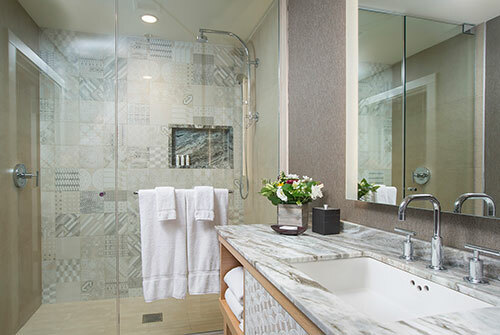 Guestrooms and Suites are infused with a tranquil elegance thanks to a palette of cool blues, whites and grays. Dramatic pops of color on luxe materials – tufted marigold headboards, plush teal benches – alongside design details that draw inspiration from suiting fabric provide a balance of masculine and feminine in each room. 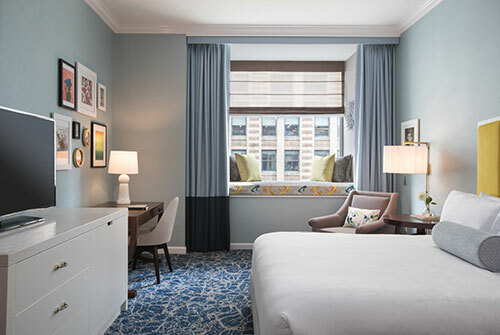 Our bay windows are still a favorite feature, where you can curl up and take in the spectacular river and city views or the collected art pieces that decorate the walls. The lobby and living room will experience a refresh as well. The new look and feel includes sleek brass accents and sourced objects from local artists and artisans. We like to think of it as a space with a spirited atmosphere and a sense of refinement that’s unafraid of being a little unconventional, much like Chicago itself. 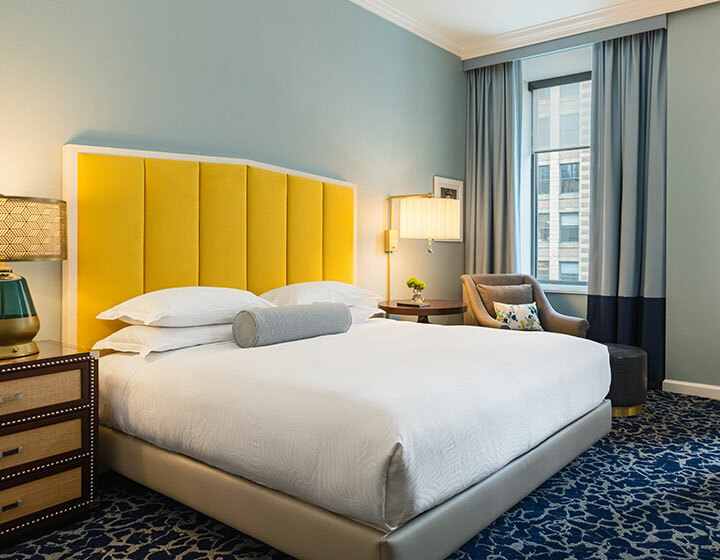 The newly transformed Kimpton Hotel Monaco Chicago reflects the dynamism and personality of the Loop, the neighborhood we call home. Chicago’s official Downtown, The Loop has become an eclectic urban playground, where business, culture and abundant greenspace converge to create a bustling waterfront cityscape. 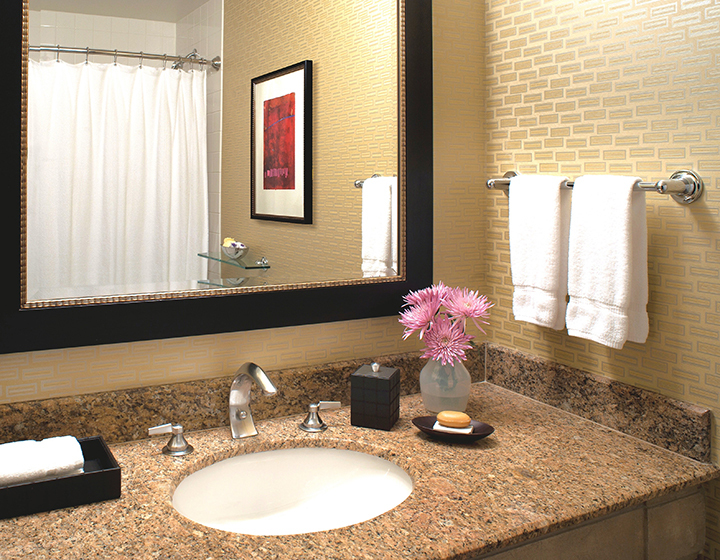 The hotel itself is steps from the Loop’s northern border of the Chicago River. Millennium Park, iconic theatres, museums and architectural landmarks as well as dining and shopping destinations are all close at hand. From architectural boat tours and 360° views from the Willis Tower Skydeck to the Riverwalk and posing for pictures in front of the Cloud Gate sculpture, only-in-Chicago activities abound in this buzzy part of town. And from a cozy perch on our famed guestroom window seats, guests can take in the fantastic views of their surroundings and contemplate all that awaits on the streets below. 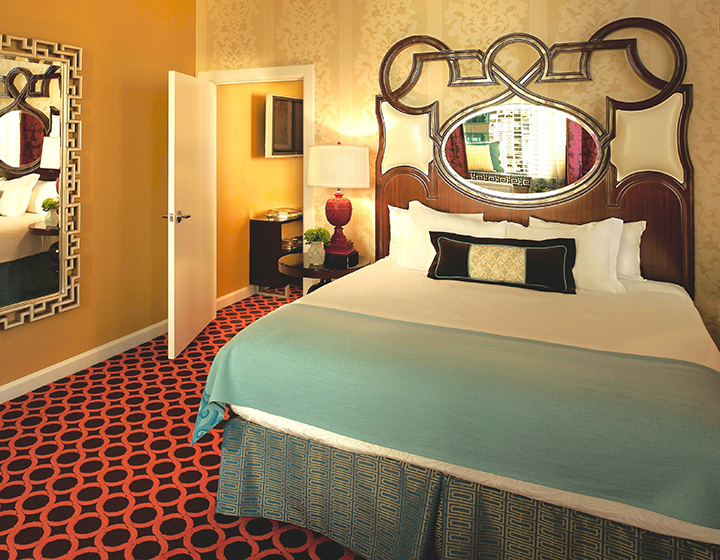 Be the first to experience our new Guestrooms - a design that pays homage to our beloved Lake Michigan! • Exclusively For Members Who Book Direct! Not a Member? Join for free: sign-up while booking. Stay in elevated style in one of our spacious new Suites, which are just the ticket for those who want to live large while in Chicago. 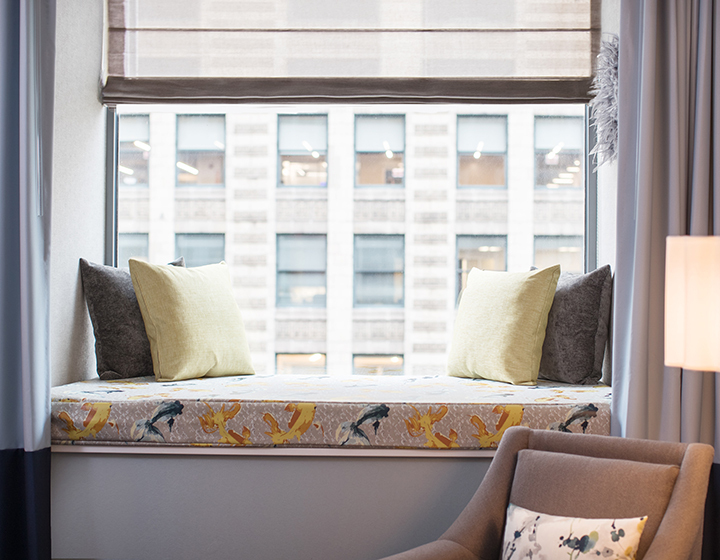 Unwind with sweeping views from a window seat or find a comfortable place to work in the sitting area. 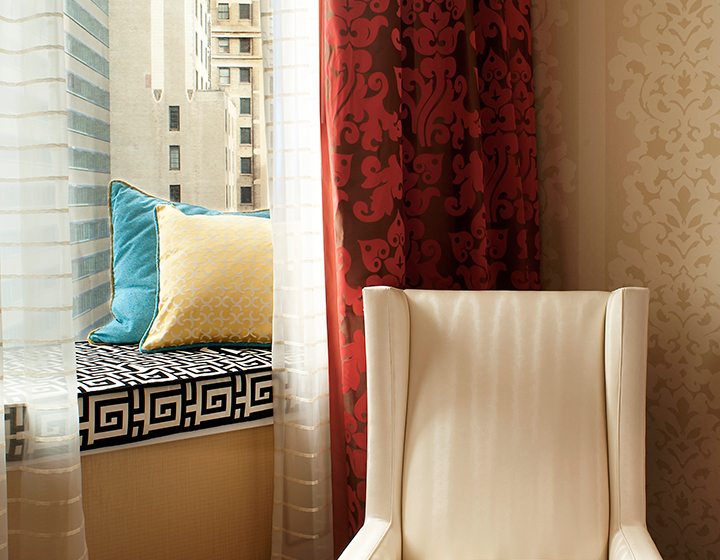 Book a Suite and receive 30% Off, available for stays through April 22, 2019.